Because of technical problems, one of Lisa Allen’s email addresses does not forward to her Gmail account. After many phone calls and calling the host company for her website, the writer/photographer was able to do a temporary fix on her account. The inbox was packed with spam, but she was reluctant to do a “check all” and delete … just in case. She discovered an acceptance email from Rockport Publishers. 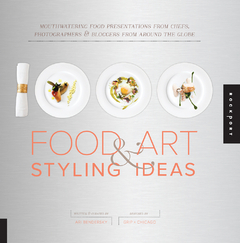 The book, “1000 FOOD ART & STYLING IDEAS” is a curated collection of photos, organized in categories such as color, global, indulge, chill and aerial, the chapter where you will find Lisa’s contribution. Artists were not paid for accepted submissions, but are offered a discount should they want to purchase the book directly from the publisher. However, a comprehensive index of the photographers and their contact information is included in the book. So you can be certain Lisa will be checking that web mail account more frequently! Moral of the story? Establish a routine for checking extra email accounts! If you don’t mind bundling all of your correspondence into a single account, arrange for your author or artist website email to be forwarded to an account you visit daily. This entry was posted in Manuscript, Photography, Publishing, Writing and tagged email, Lisa Allen, photography, publishing, Spam. Bookmark the permalink.